As an Austrian in Rome you learn one thing pretty quickly: Everything I ever knew about carbonara was a lie. Real Pasta carbonara is not made with cream and it’s much more delicious than the version they serve in schools and canteens. It’s the perfect comfort food. Because it’s a go-to recipe for our quick dinner, I wanted to post the recipe for a while. 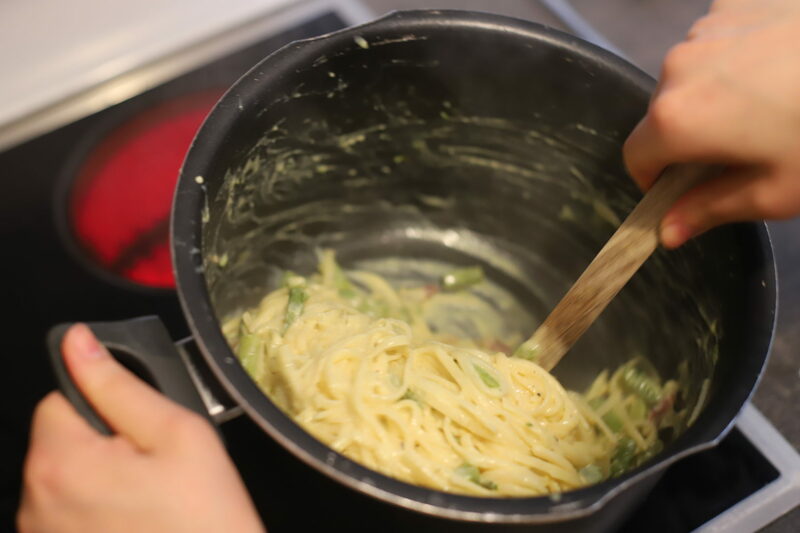 But because it’s currently asparagus season in Austria, this recipe is for asparagus carbonara. That’s us giving carbonara a seasonal and regional twist. Because we both love asparagus and we had enough of it at home, Ali had the idea for combining asparagus and carbonara. You can’t go wrong when mixing up two great things, can you? (Oh yes. you can.) This idea worked out wonderful and we have repeated it a few times since then. 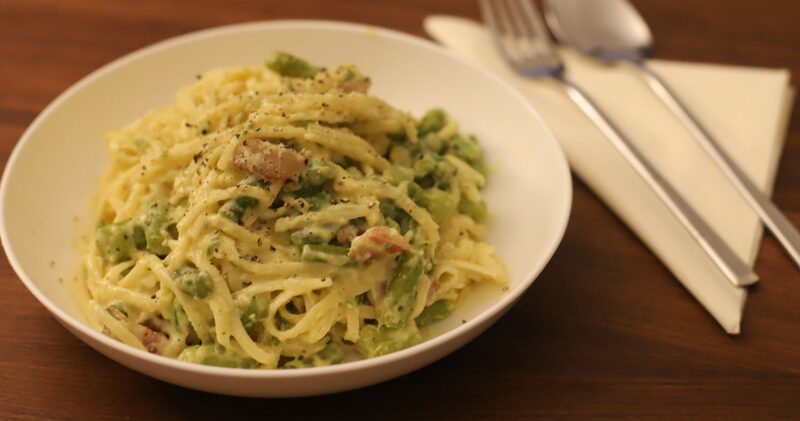 Asparagus carbonara is quite similar to standard carbonara but with a deep asparagus flavor that complements the other ingredients well. It’s made about as quickly as the standard version and you can even pretend it’s healthy with all the green between the pasta. Maybe even kids like asparagus this way? Let me know if you’ve tried. So if you can get your hands on fresh, green asparagus you should definitely give this one a try. We get ours traditionally from Marchfeld, an area in lower Austria, close to Vienna. This recipe is for 2 big or 3 medium portions. Cooking this recipe is all about timing. Get your timing right and everything will be ready exactly when you need it. If it's not, don't worry. Take things off the heat before you burn it and wait for the other ingredients to be ready. This recipe is quite forgiving. Wash the asparagus and remove the white, wooden ends of the asparagus with the knife. There should be about 300g of asparagus left to cook with. 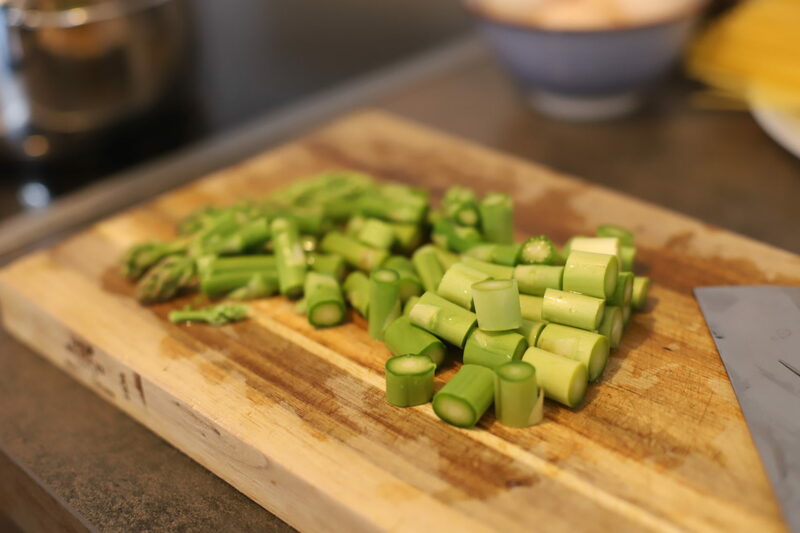 Cut the asparagus into small pieces, about an 2,5cm or one inch long. 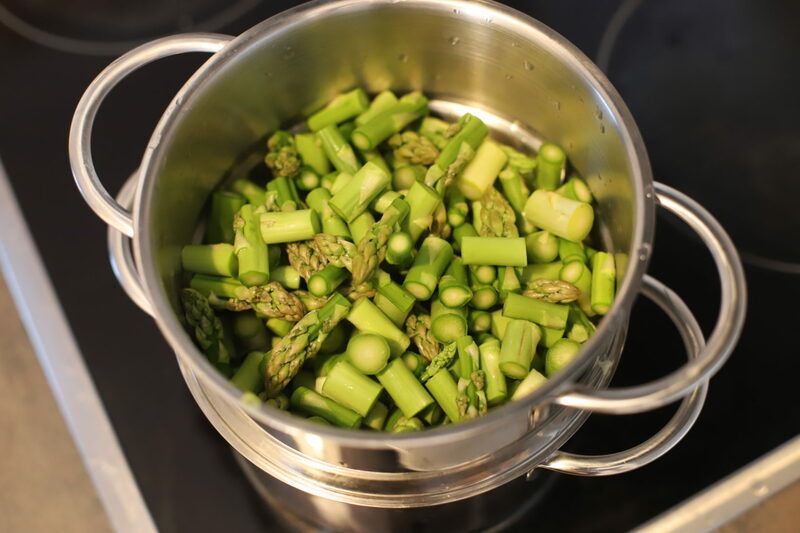 Steam or cook the asparagus until it's tender. In the meantime you can heat the water for the pasta and start preparing the sauce. 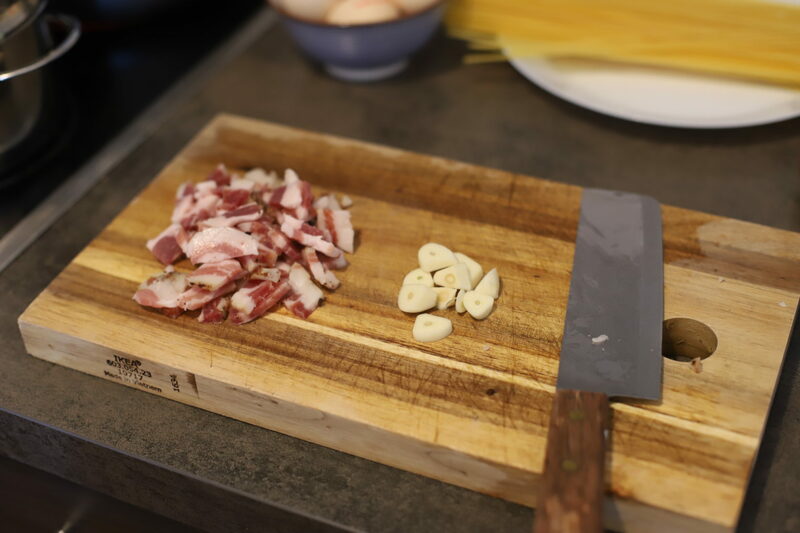 For the sauce, first cut the pancetta and the garlic into small pieces. The garlic pieces should be big enough to pick them with a fork later on. 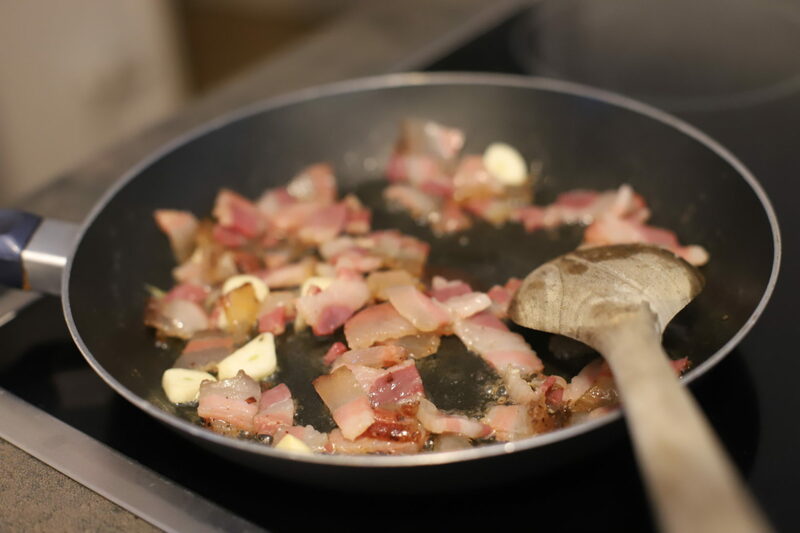 Heat the butter in a pan on medium heat and add the pancetta and the garlic. Stir the pancetta and garic occasionally. While the pancetta and garlic are getting crunchy, check the pasta water. If it's cooking, add the pasta and cook until it's done. Now you can either grate the Parmigiano and the Pecorino by hand or use a blender for the next steps. 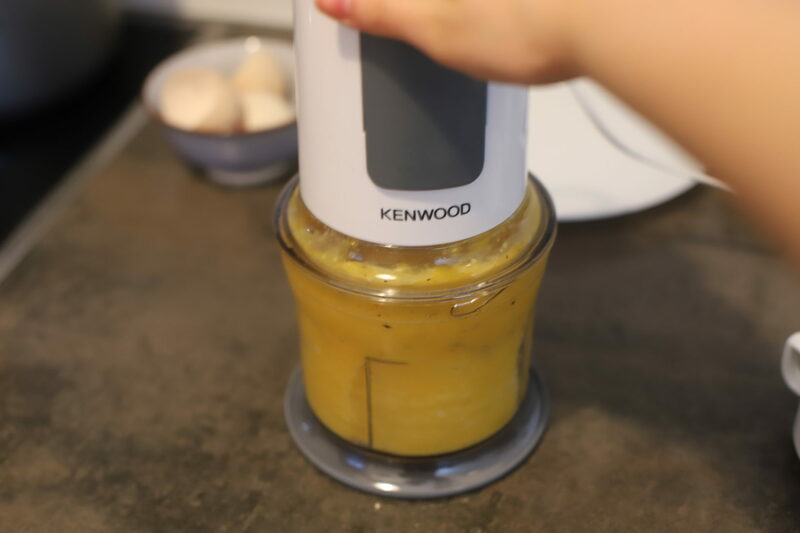 I'm lazy, I prefer the blender. 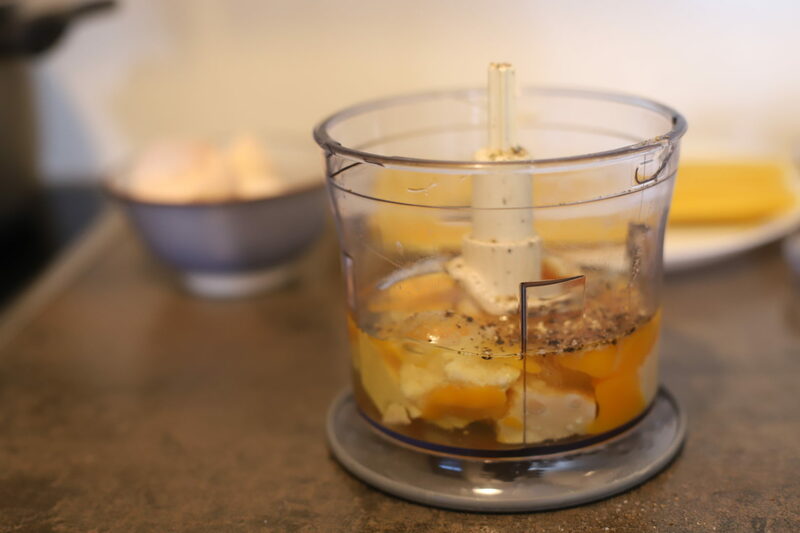 Blender: Put both cheeses in the blender, add the eggs and add some salt and pepper to the mix. Blend it for a few seconds until everything is well combined. By hand: grate both cheeses and put them in a bowl. Add the eggs, some pepper and salt and stir with a fork until everything is well combined. 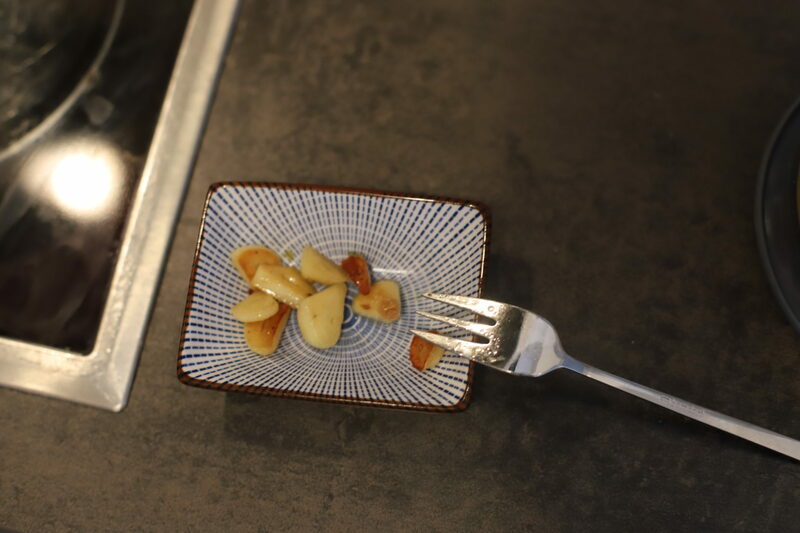 Remove the garlic from the pan with a small fork and eat it. It's now crunchy and full of flavors. Enjoy. You can thank me later. 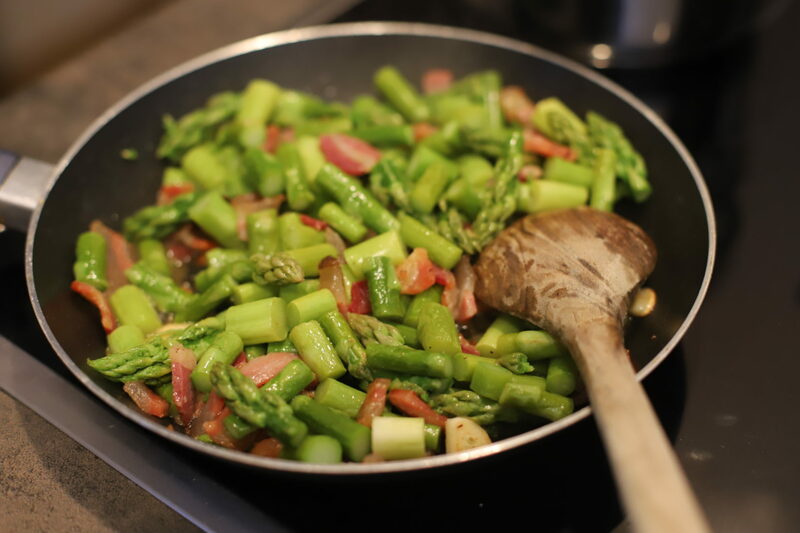 Check the asparagus and when it's soft and tender add it to the pancetta. 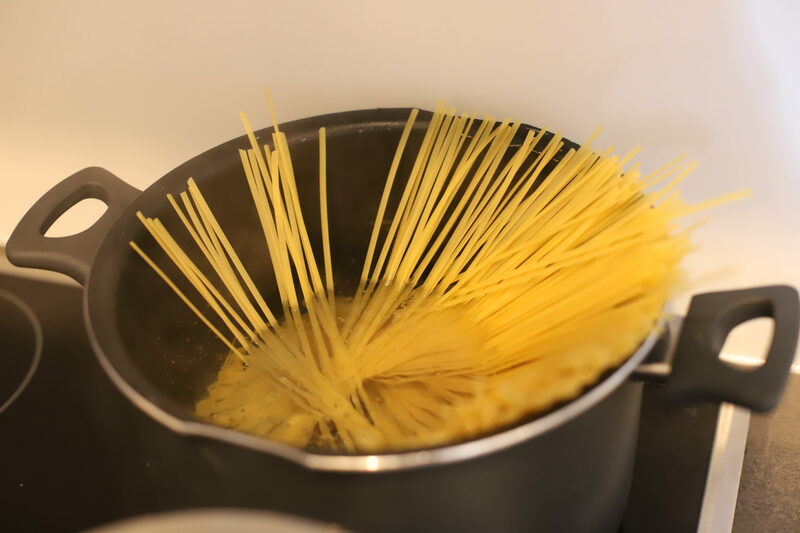 Stir on medium to low heat while you're waiting for the pasta to be done. Be careful not to burn the pancetta. When the pasta is done, the exciting part begings. The next steps need to happen very quickly, so have everything ready. Set a little pasta water aside and drain the pasta. Put it back into the pot. Don't let the pasta get cold, it should still be very hot. Add the asparagus and pancetta to the pasta. Both should be very hot too. Add the Parmigiano-Pecorino-egg-mix to the pasta and stir until well combined with the other ingredients. Stir a LOT. If the sauce seems to dry, add very little pasta water to smooth it. Stir some more and serve immediately.